What a week filled with artistic riches! Join us for exciting events of education, art and entertainment. 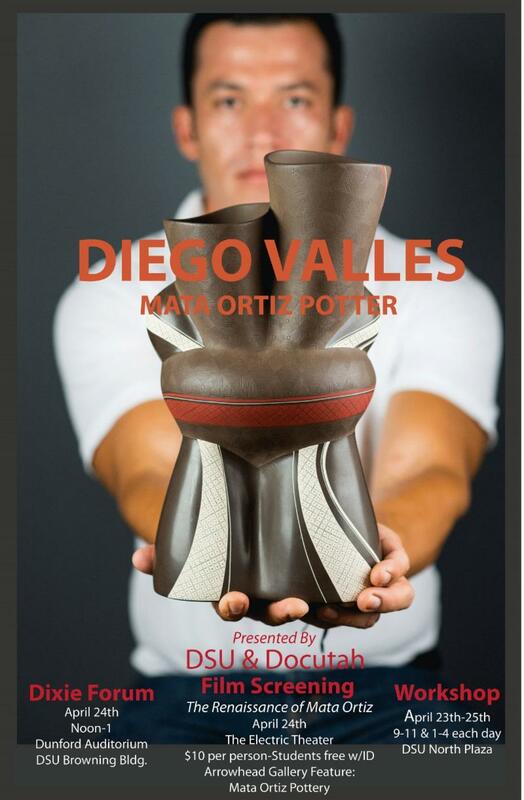 Start the week by attending one of the DSU pottery workshops open to the public, attend a fascinating lecture on April 24th with Master Potter, Diego Valles, then come to the Arrowhead Gallery and the Electric Theater for a display of pottery from Mata Ortiz and a screening of the Documentary, the Renaissance of Mata Ortiz, hosted by DOCUTAH and Diego Valles. DSU DOCUTAH joins with the Arrowhead Gallery to present a unique Film and Art Exhibit experience. The Southern Utah Art Guild (SUAG) promotes the growth and development of the visual arts throughout Southern Utah by providing opportunities, education and support for its membership including individuals, patrons and organizations. The guild welcomes both the novice and professional artist from all visual art mediums. The SUAG's Arrowhead Gallery and the Red Cliff Gallery are great places to find that perfect, unique, creative and original Holiday gift. Everyone loves the "Gift of Art". The Arrowhead Gallery is a non-profit, fine art gallery featuring a diverse selection of art from all media - painting, photography, sculpture, etc. The gallery represents over 25 artists from Southern Utah.The goal of the Arrowhead Gallery ETC is to provide an optimal environment for artists to showcase their diverse talents through creating, exhibiting, networking, and selling their art. The Southern Utah Art Guild created the gallery with the desire of enriching the cultural life of St. George and Southern Utah. The Dixie Forum is a lecture series designed to introduce Dixie students, faculty, and the St. George community to diverse ideas and personalities and to widen their world views. Forum lectures are free and open to the general public for participation. Dixie students can earn one college credit by signing up for HUM 1000, attending lectures regularly, carefully considering the ideas expressed, and writing about the presentations. This course can be repeated up to four times.